The Law Firm of Liou & Maisonet has received the Client Distinction Award by Martindale-Hubbell, regarded as the premier lawyer rating service in the country and presented to less than 1% of attorneys listed on Lawyers.com and Martindale.com. 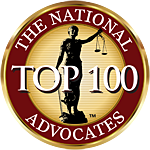 Our attorneys have been selected to The National Advocates Top 100 Lawyers List and are rated 10.0 Superb by Avvo.com. We understand that many seek our assistance during difficult times. We strive to advise each client towards his or her goals as carefully, quickly, and cost-effectively as possible. Conveniently located in downtown Manhattan, we are available when you need us. Call The Law Firm of Liou & Maisonet for attorneys who are knowledgeable, compassionate, and determined to represent your best interests. "Attorney Maisonet was professional and thorough. I had missed a court date and subsequently got an unfavorable court order. I was freaking out to say the least. Atty. Maisonet got right on it and got the order vacated, which I have read and heard is rare. After that we went back to court and needless to say the new order is fair and reasonable. He set forth a good strategy and it worked. I would use him again and highly recommend his services." "Great lawyer, very loyal and dedicated to his work. Mr. Maisonet processed my divorce in 2010 and represented me in 3 hearings ( child support, relocation and order of protection) for 18 months. He took time to explain all legal matters to me. He very articulate at his work. I came to a victory with all 3 cases. He is an amazing lawyer. I highly recommend him." "Mr. Maisonet represented me in a family court matter. He made a very difficult situation tolerable by taking the time to explain the legal process to me and providing me with excellent representation. Mr. Maisonet handles his cases in a very thorough manner leaving no stone unturned. His research skills are also terrific. If there is a settled matter from a past case that supports your case, he will find it. I will also add that he is very personable, fair, and prompt. When he says he is going to do something, it gets done. I would highly recommend Mr. Maisonet to anyone in need of legal services." "When my marriage with my ex-wife was not working out for us, I consulted with some lawyers for divorce, they told me it will take me some months to get my final Judgment of Divorce and cost me more money, but I found THE LAW FIRM OF LIOU & MAISONET who made it possible for me within a month with little money - I couldn't believe it, but it was true. Thank you for the excellent job done." "If you ever need a good, honest and professional divorce lawyer, I recommend Leta Liou. There was never and delay and I got my divorce without a hitch. Thanks Leta Liou. Continue your good work." "Leta Liou was utterly efficient, clear and concise with all communications and professional. I would absolutely recommend her to anyone seeking legal services." "Hi Leta, you represented me in a consensual divorce last August. I have been meaning to drop you a line and let you know how much I appreciate the legal services you provided me. From the first call, I was very impressed by the fact that I was able to directly contact you. You returned my call very promptly and professionally. You made the process just a breeze from the beginning to end. We had no idea that divorcing could be so painless and affordable. "D" and I are indebted to you for taking the stress and anxiety out of the process. Your work directly and positively impacted both of us. I am pursuing a new career that I am very excited about and have totally fallen in love with the most incredible man. It's all GOOD, very good." "After over a year of attempting to divorce my wife on my own and four rejected filings, I found Leta Liou's website and decided I needed help. She told me my case was pretty clearcut and in about a month I had the Judgement of Divorce in my hands. Further, it had cost much less than what I had already spent in trying to do it on my own, and less than half of what other lawyers wanted to charge me just to draw up the papers, nevermind filing costs, etc. My only regret is that I hadn't hired her services from the beginning."